All you need is pieces of paper, tape, glue sticks, hot glue or double sided tape, and these three ideas. You can use small fragments of paper. 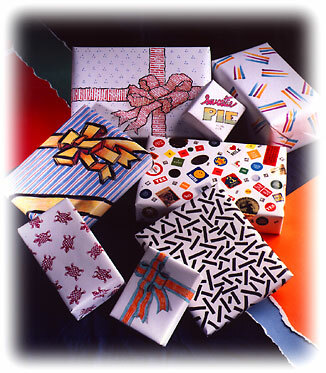 You can use odd, non-wrapping materials, such as twigs, bottle caps or even colorful breakfast foods. Focus on the front of the package. The back of the package is backstage; it's ok to let it be messy. Contrast of texture or material. Contrast of line (angled paper on rectangular boxes). 1. 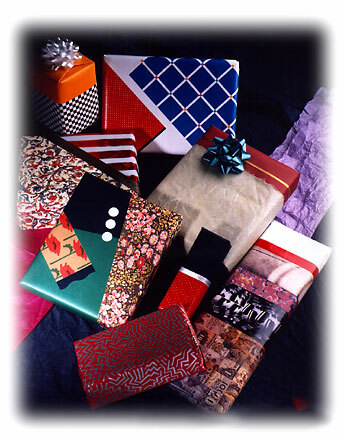 Wrap the package with any plain paper. It can be white xerox paper. It can be butcher paper. You can use more than one piece. 2. Take a rectangle of bright paper. Apply a strip of glue along the backside edge with a glue stick. 3. Lay one edge and a corner onto thewhite package. Wrap the rest around the package and tape it the backside, making bed folds as necessary. 4. Add a second rectangle of paper. It should contrast in color, texture or both with the first rectangle you have applied. 5. On this package I also added a small strip of black tape, along one edge of the red piece. When your paper is not quite big enough to wrap the box, do not despair. Two pieces often look better than one. 1. The package on the left began with the red cap, wrapping one end of the box in the traditional way with folds and tape. Then I applied the contrasting pale green fibrous paper. Last I added a ribbon and a bow. The ribbon is taped on the back. 2. The package on the right began with the checkered paper fragment. Then I added the yellow cap, folded and taped on the top of the box. The bow covers the taped area. I was using foil fragments. To cope with their messy edges, I placed a piece ribbon along the join. When you are confident of your gluing techniques, all kinds of little fragments become useful. The white dots on this package are self-stick office supplies.